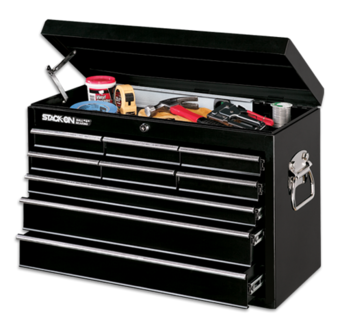 Spacious till area is perfect for storing larger tools. Includes steel lid support bracket and a full-length steel piano hinge. Chest is designed with double wall steel all construction for greater strength and durability. Drawers lock in place with a rear-locking mechanism which runs the height of each unit. Locks full-length drawers in at least two locations. Steel tubular handle can be mounted on either side of the cabinet. Cylinder key coded lock secures the lid in place. Lid must be open for the drawers to operate on the top chest.